← Is It Ok To Be Wrong? If I had a time machine, I wouldn’t go forward – it would likely depress the hell out of me – but if I could go back, then, oh man, would that be cool. I would love to see things that I’ve only read about. 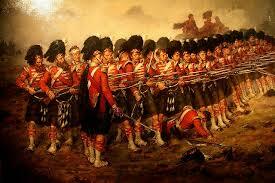 The Battle of Waterloo. The signing of the Magna Carta. The invention of the printing press. Marilyn Monroe naked. You know, the important stuff. However, since The Oldest has thus far failed to actually invent a time machine, we are bound to this world and this time. But even here in Vancouver, there is history to be found. As part of our make-this-the-best-summer-ever plan, we decided to go do something in our backyard. No, not literally in our backyard cuz that would be lame, apparently, but we decided on something close by. 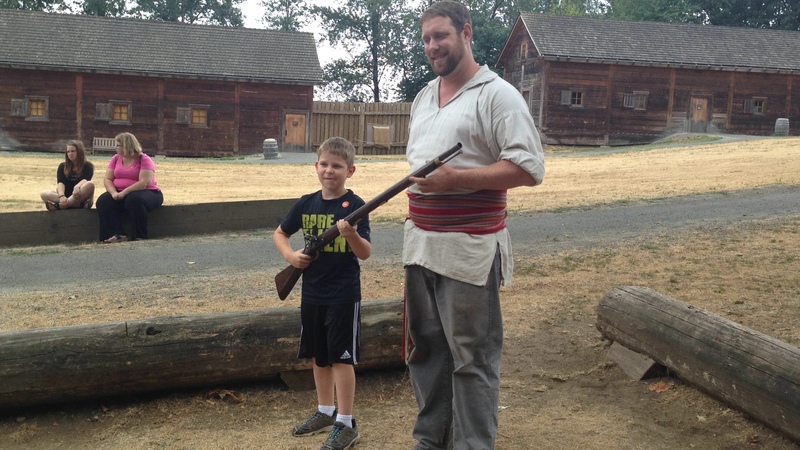 We went to see Fort Langley, a national historical site with, you know, history stuff. Ok, first, isn’t it funny how if it’s close by, you don’t often do it? We’ve lived 10 min away for years. And have we gone to see it? Ah, no. We have gone to Whistler and San Diego and exotic Victoria, but Fort Langley, it’s like it’s in a different part of the world. Or Surrey. Still, I mean, how many people in England go visit the queen? Or how many people in Washington DC go to see the Lincoln Memorial? Or how many Egyptians go wander around the pyramids? It’s just not done. But we wanted a bit of adventure and in the finest tradition of me being totally unable to predict what the boys will find fun or not, we thought, why not give the old Fort a try? We were blessed and cursed with good weather. Good news, it was warm and sunny. Bad news, we had stage 4, code red, end of the world water restriction in effect, so no green lawns that would make for such great pictures, and absolutely no fires. At first, you might think, hey, fires, no big deal, but wait a second, you’ll see. What made the site so cool, though, was that there were so many hands-on things to do. It’s the genius of modern museums. 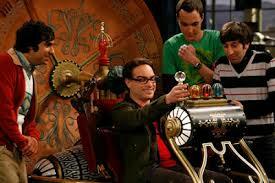 Someone, I want to say Albert Einstein, thought, hey, cool sh*t needs to be touched, played with, interacted with. And this site had that in spades. Our first exhibit set the tone: A musket demonstration. Me, I learned where the phrase ‘half-cocked’ came from (ah, it came from a musket which could be half cocked, but not yet ready to fire. ), and the boys got to see how it would have been loaded, and then were given the chance to actually try it out. Not to shoot, mind you, just hold. One of the many things I admire about The Youngest is his fearlessness when it comes to volunteering to try stuff. Want to shoot a musket? Sure! However, it might also, one day, lead to ‘want to join the army?” Sure! Anyway, The Youngest, nerf-gun guru that he is, jumped at the chance to try out a musket. Sadly, due to the restrictions, they were not allowed to do any live-fires, so all he could do was hold it and imagine. My guess is he was thinking about shooting me for not taking him skating the other day. But he held the heavy gun and did his best to aim at the wall while the instructor held the barrel (apparently, he’s not allowed to ever let go of the actual gun while someone else has it.) He was in heaven. After that exhibit, I transformed into History-Professor-Joe, that horrible creature that only comes out in forts, castles, dungeons or at parties where I’ve been drinking lemoncello. I explained how the soldiers used to fight, shoulder to shoulder, one rank of men firing at another rank of men. The Youngest, ever skeptical of anything I have to say, thought I was kidding. He thought that was pretty stupid. He said he’d lie down and shoot. Or run away. I told them how that would be seen as unmanly at the time, though good common sense for today. I think I’ll show him a video. The Oldest, on the other hand, had huge fun making a slate board house. 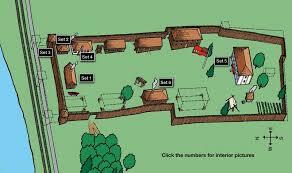 Being all minecraft-ie, he loved that he could construct the walls of a house! Who knew that real life could be like minecraft? Had he been able to mine and fend off zombies with diamond swords, we never would have got him to leave. After that, we all tried valiantly to make a barrel… and all of us failed. Even when a nice older lady came by and tried to explain how to do it. I want to say she worked there, but who knows, she may have just loved being there and dressing up. I’ve often thought I’d do that one time. You know, dress up as a walmart shopper and misdirect people. 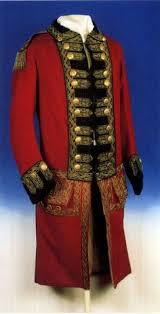 Dress up as a royal guard and stand watch near the Queen’s home. Anyway, think of barrel making as Jenga meets pick up sticks. Even when they made it as easy as they could, we could not get all the wooden parts of the barrel to fit inside that round metal thingee. I nearly had an aneurysm. 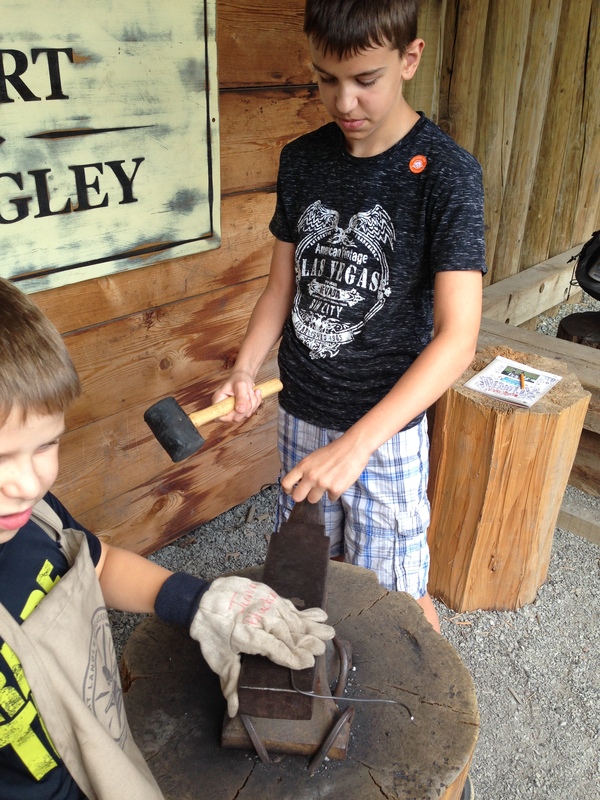 Then the boys took on hammering out things on the blacksmith anvil. The Youngest, his gloves far too large for his hands, looked a bit like he’d mashed all his fingers which made me giggle. The Oldest, after nearly braining his brother with the hammer by accident, did an admirable job of actually crafting something that looked like something. Minecraft-skills at work, again! All of us touched the furs, the cannons, the cannon balls, (Yup, I said balls), the wooden walls, the wooden windows and pretty much anything they had out on display. 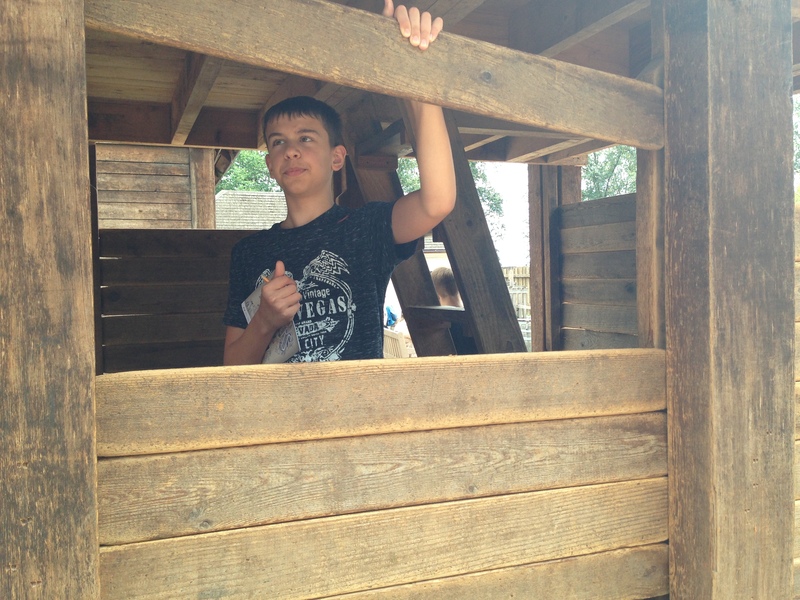 (Oh, momma, the wooden rooms smelled amazing.) We also watched a real blacksmith show us how it was done (minus the fire, which was, you know, somewhat of a critical aspect of heating the metal). Once again, The Youngest volunteered, this time to rip up rope to make kindling, but he got as much tangled up in it as he did at tearing it apart. Picture a cat that’s lost a fight with a ball of string and you kind of get an idea of the end result. The cutest moment came when we went in the big house and the boys volunteered to dress up. ‘Volunteered’ may not be the right word. I think we paid them $5 and promised never to post any pictures of them in uniforms on the internet. Too bad, cuz they looked adorable, or, in the case of the Oldest who thinks he can no longer look adorable, he looked ‘fierce’. So, all in all, a HUGE success, much to my surprise. Again, no one died, or was set on fire. No fingers were mashed with hammers. No one shot anyone. That’s my usual ‘low-bar’ way of insuring success. One of the best days we’ve had this year. Next up, a white water rafting trip and a visit to the Police Museum. This entry was posted in Parenting, Stepdad, Travel and tagged blacksmithing, DC, fort langley, history, humor, humour, lincoln memorial, muskets, red coats, reenactments, stage 3 water restrictions, step-dad, stepdad, stepdaddy, stepdaddying, the old fort, the oldest, the prettiest-girl-in-the-world, the youngest, Traveling with children, Traveling with kids, uniforms, washington, waterloo. Bookmark the permalink.